Click here for directions to Newberry College.  Download a printable copy of Newberry College's campus map here. Exit the Interstate at exit #76 (The sign says “Newberry Opera House, Newberry College") and turn left onto SC Highway 219. Go 3.2 miles, passing the high school (on the right) and Wal-Mart (on the left). Cross US-76 at the third traffic light (SC-219 turns into SC-34, Main Street ). Go 1.4 miles down Main Street, passing through three more traffic lights. Turn right (north) on College Street, passing through two traffic lights. Turn right on Evans street and then turn left on Luther street. Turn right on Bachman street. You may park in the back of the building. Exit the Interstate at exit #76 (The sign says “Newberry Opera House, Newberry College") and turn right onto SC Highway 219. Go 3.2 miles, passing the high school (on the right) and Wal-Mart (on the left). Cross US-76 at the third traffic light (SC-219 turns into SC-34, Main Street ). Go 1.4 miles down Main Street, passing through three more traffic lights. Turn right (north) on College Street, passing through two traffic lights. Turn right on Evans street and then turn left on Luther street. Turn right on Bachman street. You may park in the back of the building. Take Highway 34 East from Greenwood . Proceed through Ninety Six, Chappels, and Silverstreet. In Silverstreet, Highway 34 will merge with Highway 121. Continue on Highway 34/121 for approximately 4.5 miles until the two highways split. Go left on Boundary Street for 2 miles. Take a left onto College Street, passing through two traffic lights. Turn right on Evans street and then turn left on Luther street. Turn right on Bachman street. You may park in the back of the building. Take Highway 76 West from Prosperity for 7 miles through 1 traffic light. You will pass Wal-mart on the right. Take a left onto Main Street at the 2nd traffic light. Go 1.2 miles down Main Street, passing through three more traffic lights. Turn right (north) on College Street, passing through two traffic lights. Turn right on Evans street and then turn left on Luther street. Turn right on Bachman street. You may park in the back of the building.